I bought a calandiva a few month ago. At first everything was okay but after the flowers died, its leaves started turning brown and died. I have it on my desk where it rarely gets indirect sunlight but the fluorescent light is almost always on. I have been spraying the surface of the soil with water once every week, but the soil isn’t dry or soaked. 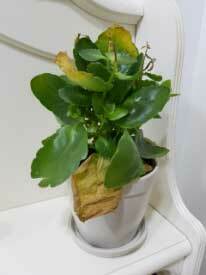 Kalanchoes struggle when they do not receive lots of direct sunlight. Fluorescent light helps as a supplement, but not as the sole source of light. Spraying the soil is not an effective way to water a plant because the water never penetrates deep into the root zone. Allow the top quarter of the soil to feel dry, then pour in enough water so that a bit trickles through the drain holes. Remove all brown leaves, as they will never recover.